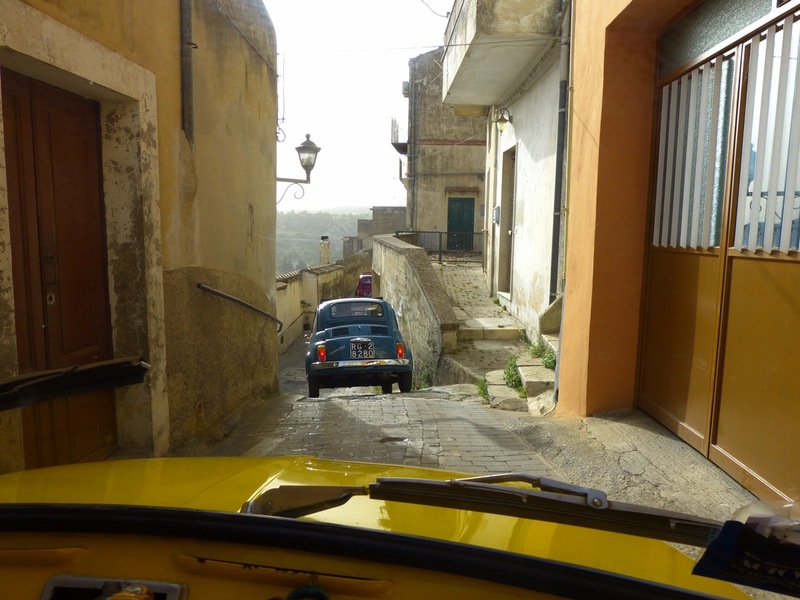 It seems like every tour we’ve been on has had its own version of Mr. Toad’s Wild Ride, and Sicily is no exception. 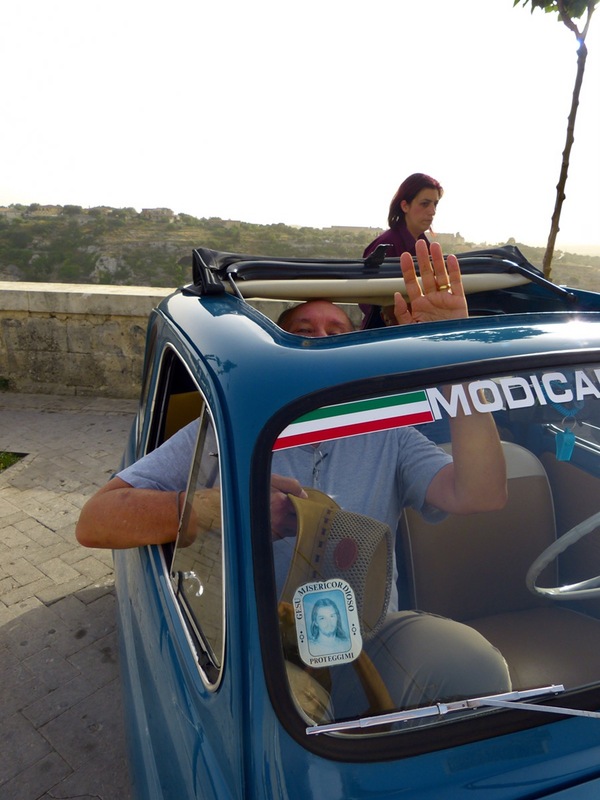 In Modica, we careened through the narrow streets in vintage fiats. No seat belts or other sissy stuff in these cars. It’s just you, your driver, and two other passengers sandwiched into these tiny vehicles. I was wondering whether Mike would be able to get into one of these, and if he did, would he ever be able to get back OUT? Okay, so now we know the answer to the first half of the question! I was also glad to see that Jesus was riding along with Mike. In fact, it looks like he’s sitting in Mike’s lap. Jesus’ name was undoubtedly invoked multiple times during our race through the alleys that the locals mistakenly think of as streets. A few weeks ago, someone on the OAT forum asked whether WE would be able to drive a Fiat 5000. After looking at the clearance on either side of the cars, you’ll have your answer. Unless you have a death wish, you wouldn’t WANT to! 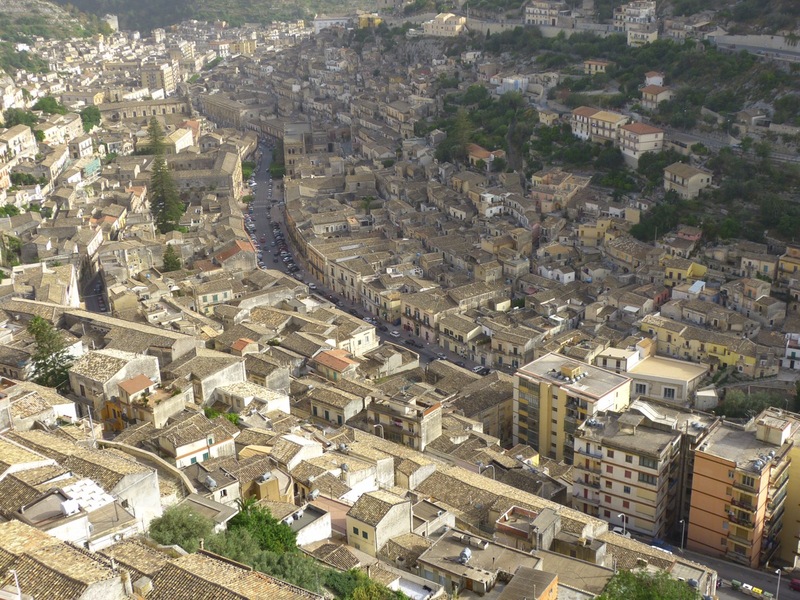 The streets of Modica are ridiculously narrow, with blind corners, sharp turns, and steep hills. I was very grateful to have an experienced local behind the wheel. You definitely had to be there, but these photos will give you an inkling of what it was like! Being by far the largest woman in the group, I decided to ride with smaller companions. That scored me a front seat, from which I took those photos. 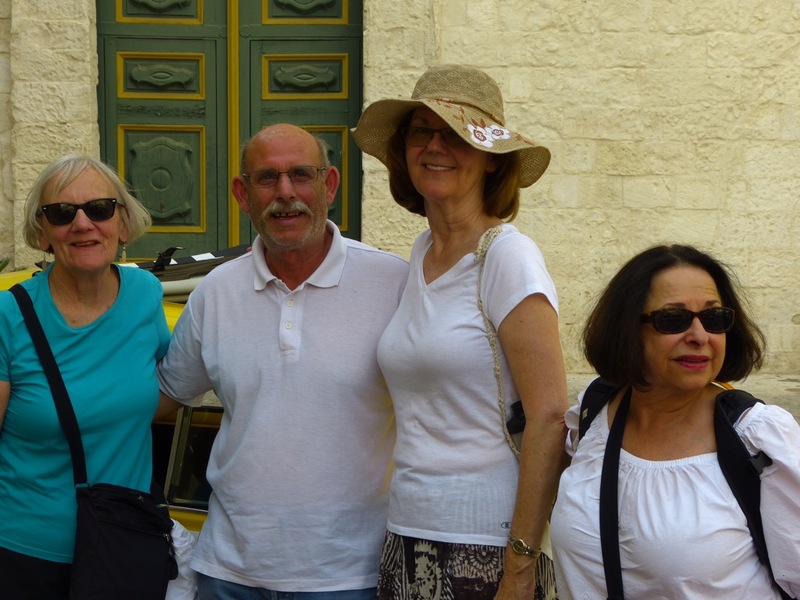 Here we are: Sue, our driver, me and Ann, still smiling after our ride ended. 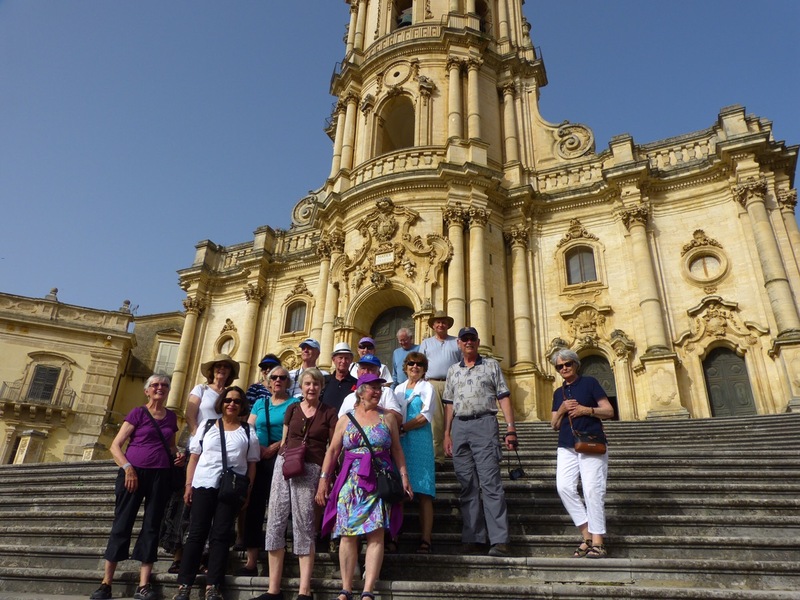 The intrepid travelers assembled on the steps of one of Modica’s many churches for a group photo. The views from the cathedral area were breath taking! We ended our evening with a visit to a chocolate shop (yes, I made purchases, which could possibly become prizes. My sisters, nieces and cousins know what THAT means!). As usual, we had an amazing dinner. As usual, there was far more food than I could possibly eat. 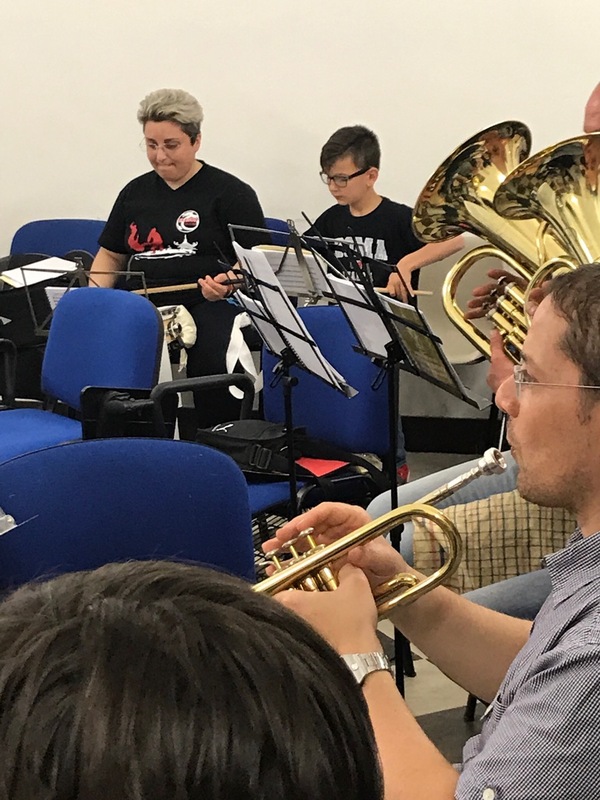 A special treat was an unexpected visit to the local community band’s practice session. We could hear them from the street, so Daniel (our wonderful guide) got permission for us to go inside. Check out that young boy. He was an AMAZING drummer. They very nicely played John Phillip Souza’s “Stars and Stripes Forever” just for us! What a wonderful memory. 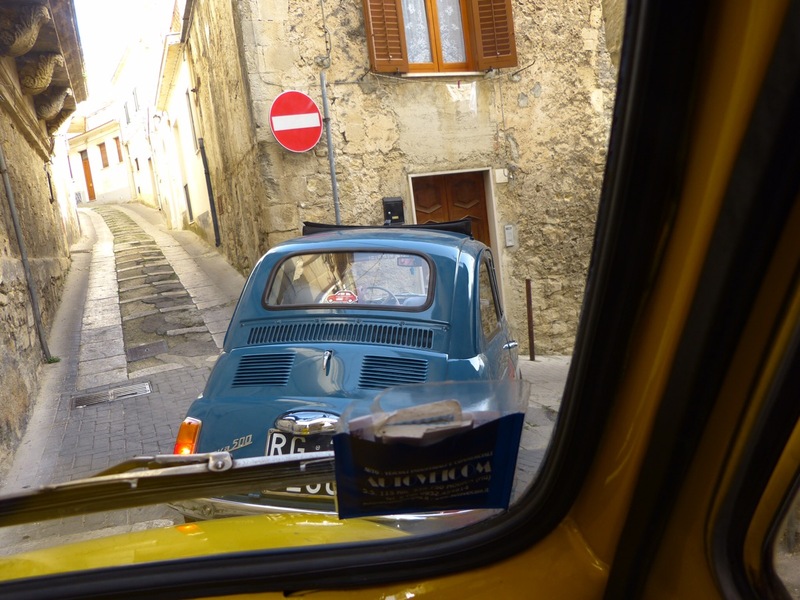 The Fiats look perfectly sized for those streets. I don’t think I’d want to be sandwiched in the back seat, but the front seat seems a little too exposed to the… um… engine and windshield… yikes! I couldn’t have handled the back seat either. Takes me back to driving a station wagon through streets like this when I took our first grandson to meet his Italian great grandmother. What a ride! Okay, so you didn’t throw up in Guatemala, but you DID throw up in NJ when I was driving???!!! Sounds like an awesome adventure!! Next Next post: Oh, To Be Rich in Ancient Sicily!